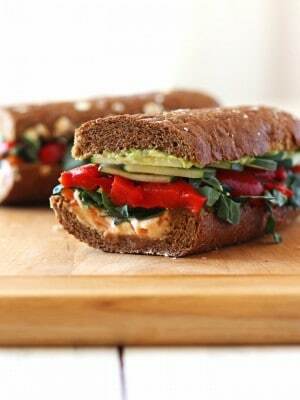 Learn how to make an awesome vegetarian sandwich, even if you hate tofu! 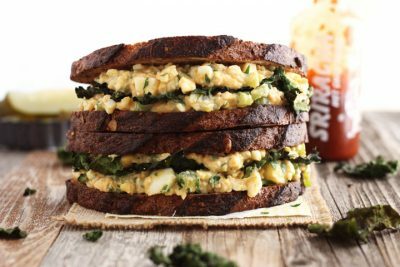 Below are 19 flavor-packed ridiculously delicious vegetarian sandwiches, wraps and toasts you’re going to love. Is there a bad time for Sandwiches? They’re the best food to take on a picnic, are easy to pack for lunch and how would you ever survive the summer without “sandwich night” for dinner at least 3 times a week? Sandwiches can be a snooze-fest too. Nothing is more boring than eating the same thing every day for lunch, even when it’s your favorite. 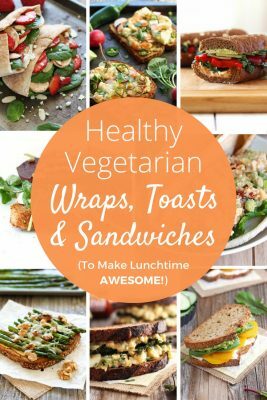 That’s why we’ve put together a list of healthy vegetarian sandwiches, wraps and toasts bound to inspire your lunch (or dinner) creations. Each one is packed with so much taste-bud tingling flavor we guarantee you’ll think they’re all awesome. Enjoy! 1. ROASTED RED PEPPER, CARROT AND HUMMUS SANDWICH from Toaster Oven Love. This sandwich and I go waaaay back – almost 20 years! I dare you to not fall deeply in flavor love with this roasted red pepper, hummus, avocado, kale and carrot stuffed sandwich. It’s quick to make and vegan too. Sweet earthy roasted beets and salty cottage cheese are a match made in flavor heaven. Add in some whole grain toasts, bitter greens, balsamic vinegar and a drizzle of honey for an ultimate low calorie – high protein lunch! Prefer your salad sandwiches more tangy than creamy? Stuff this olive oil – lemon juice dressed chickpea and spinach salad into a chewy pita for a deliciously light summertime lunch. 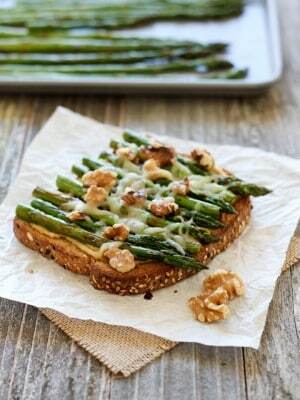 A unique toast that’s all kinds of delicious featuring: creamy garlic hummus, tangy balsamic vinegar, buttery walnuts and sweet roasted spring asparagus spears. 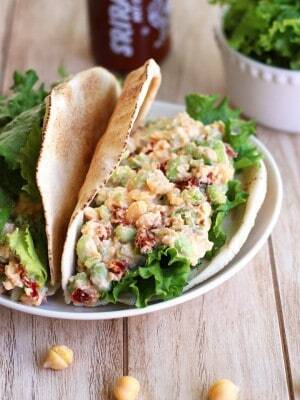 Trade in your cold cuts for this crispy, crunchy, sweet and spicy mashed chickpea edamame salad! The recipe makes two flavorful pitas, each packed with 20 grams of protein and guaranteed to keep you full until dinner. A creamy crunchy mayo-free salad of smashed chickpeas, avocado, feta cheese, crunchy celery and herby parsley. Move over soggy tuna salad – there’s a new salad sandwich boss in town! Spice up your lunchtime routine with a creamy egg salad that’s lightened up with Greek yogurt and packs a flavorful Sriracha punch. Layer with flaky garlic kale chips you can make at home or at work using your toaster oven! Baked tofu slices slathered in a creamy Thai inspired peanut butter sauce and served with spicy Sriracha mayo. Your coworkers will be green with envy when you bust out this restaurant-level desk lunch. We’ve made this recipe 3 times in the last month! If you don’t like tofu you have to try this recipe, one bite of that peanut butter crusted tofu and your mind will be changed for good. A perfect summer lunch that’s big on flavor and full of quality high-protein ingredients. Plus, learn a few tricks for making and storing golden beets. Enjoy a tasty high-protein lunchtime boost from marinated baked tempeh on toasted whole grain bread with sprouts and tomato. Simple, healthy and delicious! 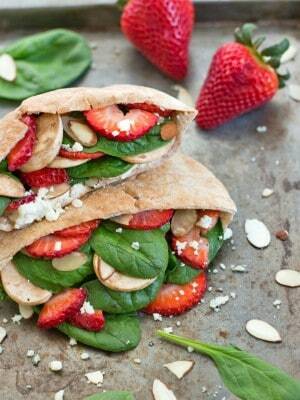 Imagine your favorite strawberry, spinach and blue cheese salad drizzled with balsamic vinegar and stuffed in a handy pita pocket. Super Easy – Super Tasty. OMG, veggies wrapped in veggies! 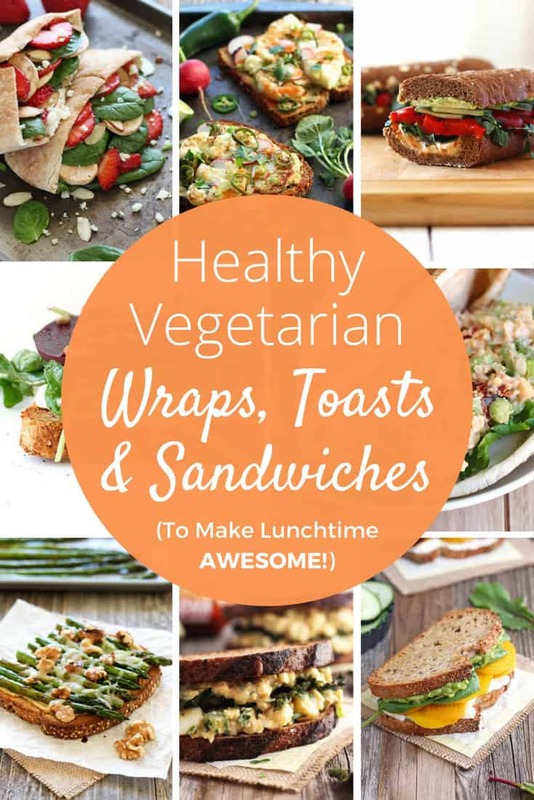 Enjoy a crunchy lunch full of too many vegetables to count with this easy to customize vegan and gluten-free hummus wrap. Spicy baked falafel, roasted veggies, sun-dried tomatoes and a magic green sauce all stuffed into a chewy naan. A little bit of extra effort but oh what a T-R-E-A-T! 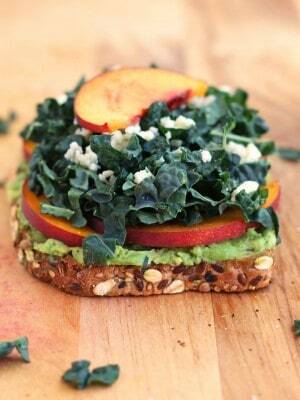 A refreshing lunch of juicy summer peaches, creamy avocado, tangy blue cheese and crunchy fresh kale on crispy whole grain toasts. Throw them together in less than 15 minutes and survive the summer heat in style. A sub roll topped with meaty Portobello mushrooms, sautéed pepper and onions and your choice of 4 different vegan cheese sauces – come to Momma 🙂 Pre-chop the veggies on the weekend and you can throw this meaty meatless sandwich together in no time. 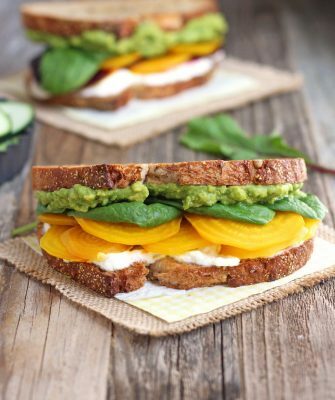 Layer upon layer of veggie-filled texture and flavor! Seriously look at those thick tomato slices, creamy avocado, crispy red onion, crunchy sprouts and don’t even get me started on the black pepper lemon mayo. The vegan answer to your Italian meatball sub cravings. Sourdough bread topped with meaty mushroom and high-protein quinoa meatballs covered in your favorite red sauce. Does it get better than this? Nope! Buttery jalapeno roasted cauliflower, crunchy radishes and creamy avocado on toasted whole grain bread. 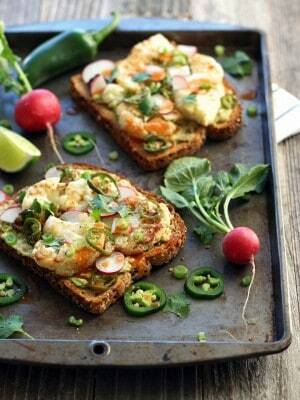 There’s layer upon layer of nutritious spicy flavor in an avocado toast to end them all! And if you share your biggest frustration with trying to eat a healthy lunch in the comments below, we’ll do our best to get you some helpful solutions! Yay I’m glad you liked it Liz! Oh my gosh with that naan-wich right 🙂 soooo yummy looking! OMG these all look fantastic! Thank you so much for including my portobello sandwich!